The following collage superimposes three images atop one another. 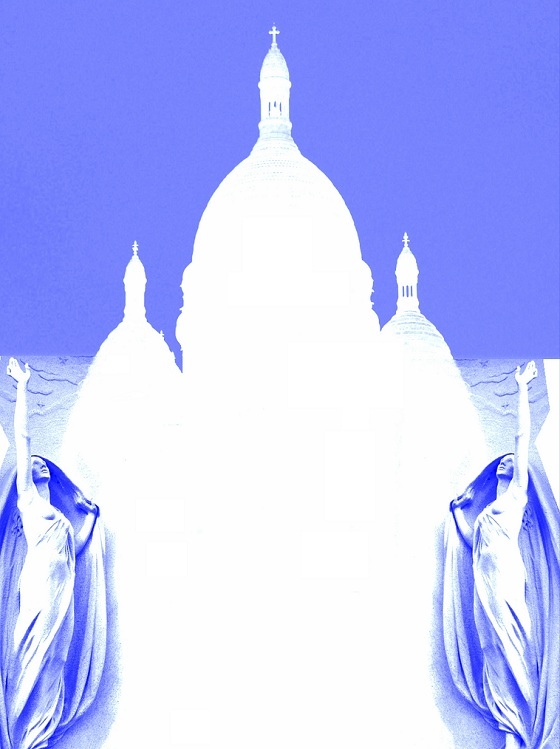 In the background stands a silhouette of the Sacré-Cœur Basilica in Paris. Below on either side are the mirror images of a statue in Philadelphia’s Laurel Hill Cemetery. I used an HP M537 PhotoSmart camera to photograph the basilica, a Nikon D3100 to photograph the statue, and two photo editing programs to manipulate the digital images (i.e., Microsoft Picture It! and Google’s Picasa). “Let me tell you about heartache and the loss of God. Immaculate, © 2013 by Gina Marie Lazar Lovrencevic.